“Lovely Lattice” is indeed lovely. This is a stamp set that is available only through Sale-A-Brations which ends March 31st. Poppy Parade and Whisper White is the color theme for this card. Poppy Parade was an in-color several years ago and I am so happy Stampin’Up brought it back. It is an orange-red unlike Real Red which is more of a blue-red. The artwork features poppies which I colored with Poppy Parade and Call Me Clover and feature rhinestones in the flower centers. The artwork is framed in Basic Black and the die-cut sentiment is layered on 1/2” Textured Weave Poppy Parade ribbon. The corners of each piece of card stock have been rounded with the Detailed Trio Punch. This punch is the easiest corner rounder I have ever used. The second sample of “Lovely Lattice” is for the crafter who loves to color (which I do). 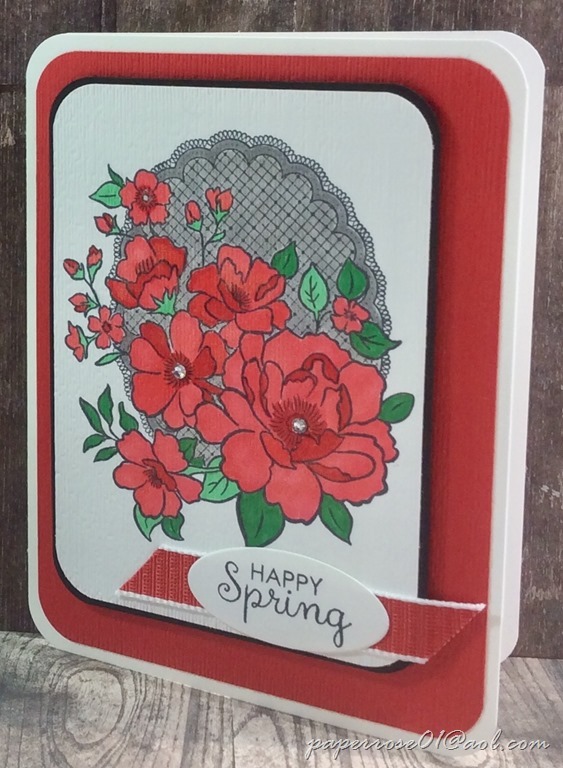 Like the sample above, the flowers are colored with Stampin’ Blends Poppy Parade, Call Me Clover and Shaded Spruce. The background artwork is colored with Smoky Slate. If you are a crafter who would like some help with the coloring, please let me know! I would be more than happy to color for you. “Lovely Lattice” could easily be done in other colors. I have seen samples where the entire image was fussy cut and other samples where only a few of the flowers were framed. This set has many possibilities. As a reminder, April Stamp Camp is being held on Thursday April 4th from 12-6 pm, Friday April 5th from 2-6 PM, and Saturday April 6th from 9 am-4pm. If you have a conflict with these times/dates, please let me know and I will find a date/time that works for you. The cost for Stamp Camp is $14 for 4 cards. If you wish to make additional cards, the cost is $3 each. If you can let me know which day you are coming it is helpful in cutting card stock. And if you need help with coloring – Lovely Lattice and/or Fable Friends – please let me know. I know it seems far off, but May Stamp Camp is May 2nd, 3rd, and 4th. We will be doing cards for our lady friends. 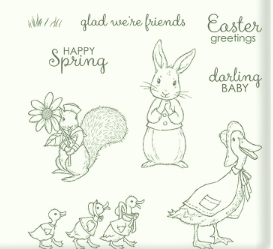 I love the spring “Fable Friends” stamp set. It is impossible to make a ”bad” card with these cute images. Spring and gingham paper just seem to go together! As the Gingham Gala 6X6 Designer Paper is in the Occasions Catalog which retires Jun3rd, I have purchased several packets for future use. In this image we see the darling bunny atop freshly mowed Granny Apple Green grass. 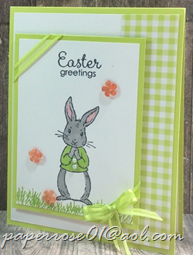 The bunny is stamped in Memento Tuxedo Black and colored with Stampin’ Blends. His jacket features 2 tiny pearls. The artwork is framed in Lemon Lime Twist and embellished with Lemon Lime Twist Gingham Gala DSP and organdy ribbon. 3 Frosted Flower embellishments add a spring touch. Although I am choosing to use this sweet card for Easter, it is appropriate for most occasions. This happy squirrel is celebrating spring. He is stamped with my favorite black ink – Memento Tuxedo Black – and colored with Stampin’ Blends. He is standing amid grass that appears to need a good mowing! I chose to color his daisy Pineapple Punch for that bright yellow color. The center of the daisy holds a retired epoxy droplet that has been colored with Blends. Grapefruit Grove frames the artwork and the matching ribbon and Gingham Gala DSP adds interest. 3 Highland Heather Frosted Flower embellishments add a contrasting touch. I had a bit of trouble when I stamped the “Happy Spring” sentiment. To fix my blemish, I restamped the sentiment on scrap, die cut it and adhered it over my mistake. This would make a darling Congratulations card. This cute set also features Mama Duck and her offspring. At April Stamp Camp, you can choose to make a duck card if you wish. I love the Fable Friends cards. If you wish, you can choose to make both of these cards and not make one of the others. This keeps you in the 4 cards for $14. If you can let me know what day you plan on coming to April Stamp Camp, it helps me cut the correct amount of paper. 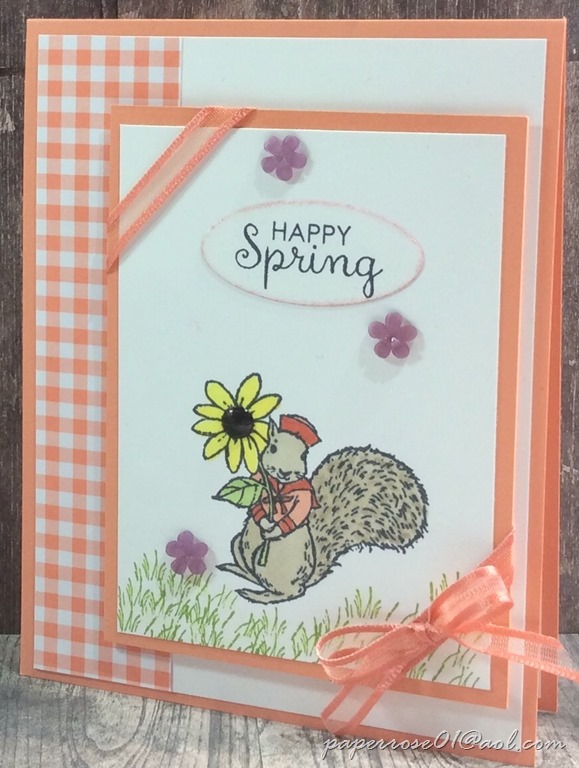 The Paper Rose theme for April is “Welcome Spring” and this card certainly looks like spring! “Lasting Lily” is one of the new “DISTINKTIVE” stamps from Stampin’Up. “DISTINKTIVE” stamps give you photo-realistic images with just one stamp. They have a special texture that gives added depth and dimension in a single step. These stamps are available only from Stampin’ Up! and are made using a patent-pending process. DISTINKTIVE stamps are available in red rubber and photopolymer; Paper Pumpkin’s April kit includes photopolymer stamps. Shop “DISTINKTIVE” stamps in the online store by searching “DISTINKTIVE,” or look for the “DISTINKTIVE” icon in Stampin’ Up! catalogs. 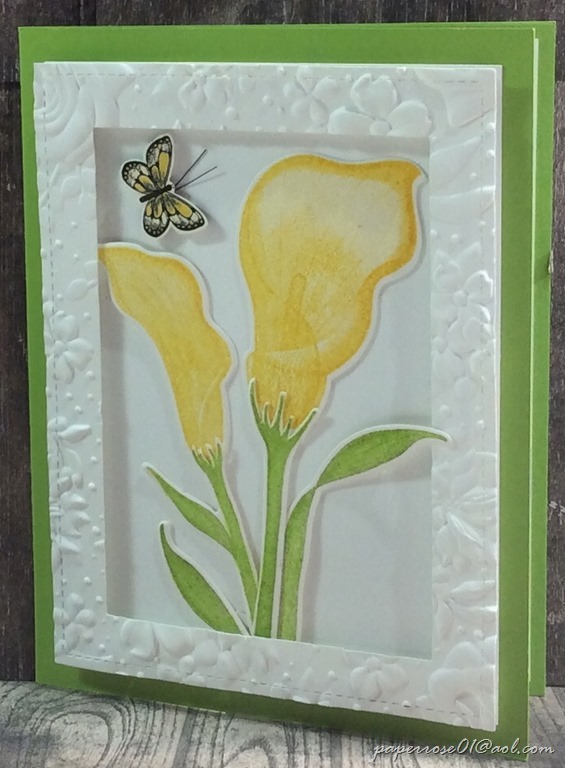 This lovely card features an open lily and a bud stamped in Daffodil Delight. Can you see the definition in the lily and in the Granny Apple Green leaves? I purchased the framelits for Lasting Lily before they sold out. Having the abiity to die cut the images is something I enjoy. However, these would be very simple to fussy cut. This set is part of Sale-A-Brations and will be gone after March 31st. I chose to make a frame to showcase the lilies. I used the stitched rectangular dies to cut the shape and then ran the frame thru the Big Shot with the Country Floral Dynamic Textured Impressions Embossing Folder. The die cut lily images were adhered to 5 X 3 3/4” Whisper White cs and the frame was adhered over the art work with SU Foam Adhesive Strips. A butterfly from the Sale-A-Bration Botanical Butterfly was added to provide eye appeal. Although this makes a perfect sympathy card, I have chosen to use my Lasting Lily card for Easter. I love the detail this set provides and I look forward to stamping more “distinctive” stamps in the future. The main Stampin’Up catalog is thru June 3, 2019. As the 2017-2019 In Colors will retire at that time, I would suggest you purchase any card stock, inks, embellishments in these colors now. As in the past, these retiring colors tend to sell out before the retirement date and then it is too late. The smaller Occasions Catalog also retires June 3rd. I think the “Tea Together” stamp set is carrying over as is the butterfly Duet Punch and the Cake Builder Punch. Other items may sell out before June 3rd so if there is something you feel would enhance your craft library, now is the time to purchase it. 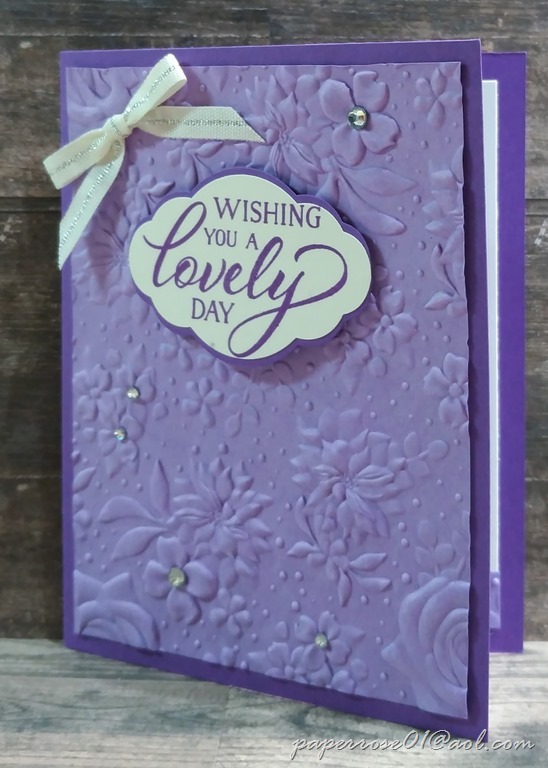 This is a super easy card that allows the embossing folder to do all the work!!! 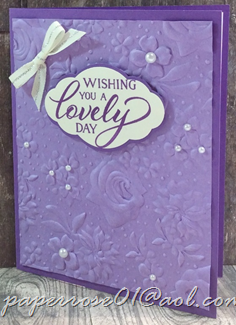 The Country Floral Dynamic Textured Impressions Embossing Folder (available thru Sale-A-Brations) provides the texture for an absolutely beautiful card. One thing I noted when working with this folder is that the embossed cs layer shrinks in length a bit after running thru the Big Shot. Adding 1/16” to the cs length when cutting compensates for the loss. We designed this card simply – adding rhinestones or pearls, a sentiment framed in Gorgeous Grape, and a small bow. The frame for the sentiment is formed by punching or die cutting the same shape as the sentiment, cutting it in half lengthwise, and adhering it to the sentiment so that the color shows slightly on both the top and the bottom. All label punches or dies can provide this frame effect by cutting the frame piece in half so that it will overhang the sentiment. The sample above shows the finished card with rhinestones. The sample to the right shows the finished card embellished with pearls. Which one embellishment would you like to do? 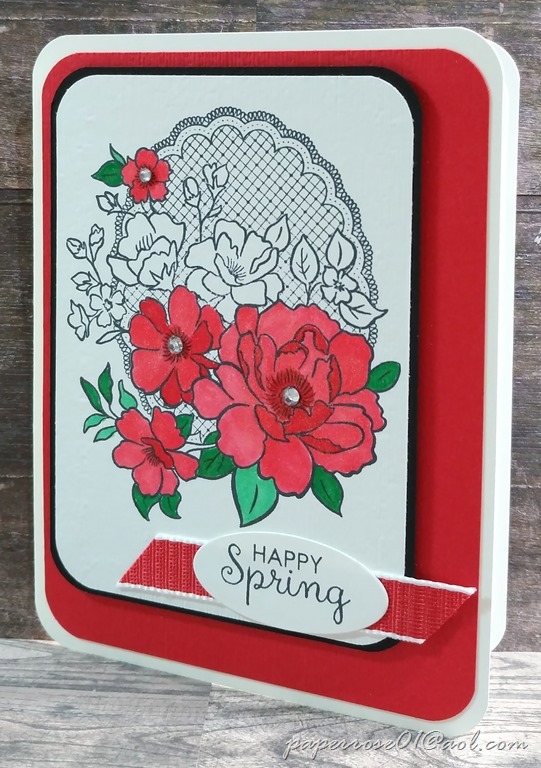 I have seen this embossing folder used many ways – embossed on white cs and with the flowers colored using Stampin’ Blends, inking the embossing folder so the embossed and debossed areas contrast, using only small portions of the embossed folder on a card. With our Lasting Lily card, we are going to use the Country Floral embossing folder to make a lovely frame. April Stamp Camp (can you believe it is almost April?) is being held on Thursday April 4th from 12-6 pm, Friday April 5th from 2-6 PM, and Saturday April 6th from 9 am-4pm. If you have a conflict with these times/dates, please let me know and I will find a date/time that works for you. The cost for Stamp Camp is $14 for 4 cards. If you wish to make additional cards, the cost is $3 each. Are you procrastinating about joining my Paper Rose team during Sale-A-Bration (ends March 31st)? I joined Stampin’ Up 15 years ago just to enjoy the discount and save money – to feed my crafting habit. So, if you’re thinking of joining for the discount…go for it. You never know where it will take you. There is no penalty whatsoever if you join for the discount and then decide to drop. Sale-a-Bration is one of the best times of the year to join. Let me know if you are interested in joining my team – joining for the discount is absolutely okay!